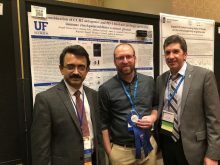 Joe Flores-Toro, a graduate student in the Harrison lab, was the recipient of a Best Poster award at the 23rd Annual Meeting of the Society for Neuro-oncology. The title of his presentation was “The combination of CCR2 antagonist and PD-1 blockade prolongs survival in immune checkpoint inhibitor resistant gliomas.” Shown with Joe are the Scientific Program Chairs: Drs. Vinay Puduvalli (left) and Frank Furnari (right).